Welcome to my blog 1 of 6. Each week this blog will describe my journey through each of the 6 countries featured in my documentary 6North. But, not all of the information will be revealed. The blog will give you an insight into the differences of each culture and the student’s story I recorded. Therefore, this blog is an appetiser until editing is complete later on this year. First I will edit a fifty minute episode titled ‘The Making of 6 North’ and then I will edit one 24 minute episode for each of the six countries. So, in the meantime, just sit back and enjoy this read until you can watch the films. My preparations for my self-funded documentary film 6 North journey had to start months before traveling. I had so much to organise before leaving Australia that I was exhausted the night before flying out. Most travel agents couldn’t quote me a price that met my budget, which was only $4,000. After spending money on TV quality camera and sound equipment this meager sum was all I could afford for my visits to the 6 countries that feature in the first series of 6North. Such a dismal budget I know, and in hindsight it seems incredible that I actually did it on budget which included all flights for 2 people. A long time friend in the travel industry Stephen Chung at Connections Travel in the Central Market secured me a low cost flight to Japan’s Kansai airport and a return flight to Adelaide via Ho Chi Min City and Kuala Lumpur by MAS but this was just the beginning, the rest of the intermediate flights I had to arrange by myself on the Net because it was the cheapest way. That’s the way the world is going now, in some instances customers can buy for less than agents, so I’m told. Well I was adamant that if I tried hard enough, my goals could be met. I finally got it all sorted but not without many sleepless nights of worry. That was so much stress. It was worth every effort though, because it meant that I could meet the students and parents that I had been corresponding with since the idea for filming began and each rendezvous was already planned. They had all returned home after studying in Australia, Adelaide mostly, and were looking forward to hosting me in return. I started my journey without a mobile phone. I took just a PC in case I needed to contact someone on FB or emails. In China of course this didn’t work because the PRC have not permitted Google to operate. I decided not to connect my mobile phone with any local service providers in order to see how generous people might be to assist me ‘on the road’, so I was pretty much at the mercy of strangers! This is now a fast and distracted world as a result of mobile ‘phone technology and everyday I see people with their head down focused on their ‘phone but not really communicating with other people right next to them. Have you noticed that too? Something is changing in our world and I wanted to know if it is still possible to get help from people who are engrossed by their mobiles by getting them to communicate with me face to face. You might be wondering if it worked, well I can save you the wait by telling you now that after my adventure without a local connection to my mobile I am happy to confirm that people can still be relied upon to help you. This is despite them being preoccupied with their mobiles when I approached them to ask if they could make a call from their own ‘phone on my behalf. It worked. (This however had to change because at the very last minutes literally 2 days prior to returning to Adelaide we had to connect our mobile phone to a KL service provider, so read about this in Part 5 of 6 North where we had no choice but to connect). So, back to my first flight out of Australia. In the cold early hours of the morning on Wednesday 8th April I left Adelaide to experience for my first time the ‘SAKURA’ Cherry Blossoms in Japan. However I had visited Japan before in 2008 (as written in my book) but it was during late December (no blossom time) and I was in Nagoya instead. Thank you to my dear friend Sokhan for driving me to the Airport so early in the morning when we all would have much preferred to stay in our nice warm beds. The Sakura is a wonderful sight that has been described to us so proudly by the many Japanese students who, over 17 years, came to live with us, so we just had to see it. They had advised us that if we were ever going to be in Japan we should plan it to coincide with the blossom season, so we did. My goal was to make it happen this year and I am so glad that I plucked up the courage to follow my dream. At Adelaide airport I boarded the MAS plane to KLIA. After a 7 hour flight to KL I had to stay in the airport for another 7 hours waiting for the connecting MAS flight to Kansai that was due to arrive in Japan at 7 the next morning. This however did not happen! MAS announced that my flight would be delayed due to mechanical problems and that meant that I wouldn’t be leaving until 3.30am local time. I stressed but Stephen remained calm as usual because he said it was better that MAS solves a problem while the plane is still on the ground and this made sense. The filming session was already booked and I was going to have to start filming the moment I arrived in Japan. Kansai is an 88 minutes coach ride to my student’s meeting point at JR transport station for commuters who use the subway, bus and train lines in Kyoto. Suvaco Store within this station was our meeting point with my student. So, even after I was supposed to arrive in Japan I still had a long way to go to meet up with my interviewee. This meant that I would have been awake for at least 36 hours and have to do the interview without any proper rest. I wondered if I could have been upgraded to business class free of charge so that at least I could sleep on one of those really fancy reclining chairs and arrive at Kansai refreshed but this was never going to happen was it. I was lucky that we didn’t have to buy local Malaysian currency to buy refreshments that day because I still had some cash from my previous scouting trip last September. I had made sure that I still had some local change left over for emergencies. I certainly had enough to buy late lunch/early dinner which I did, but it wasn’t cheap within KLIA. At KLIA after hearing that my plane has been delayed I went to the MAS counter and asked if there was any chance that I may be upgraded or at least sit in their airport lounge for a better rest. I know from my past experiences of traveling business class that their private lounge would help me take off some of the stress. All I got from the ground staff after speaking with the senior staff in charge was a MR$20 voucher (Aus$5.50) to purchase meals as compensation for the delay, a meal that I would have been provided if I had boarded at the right time. At this stage I also had on hand my letter asking MAS to consider sponsoring my flights which I had sent to MAS some months before. I handed it to the senior staff to forward personally to the decision-makers at MAS because up until then I had not heard from MAS. I told the senior staff member that I was disappointed by this. I had described in the letter how good our documentary could be for their public image in the student/school/University sector because thousands of students come to Australia from all around the world. I thought this senior staff member may forward it directly to someone in charge of sponsorship. Anyway, a month has passed now since then and we still have no acknowledgement from MAS about our letter. Funny that, eh. I wasn’t going to let this flight delay situation get me down. As long as MAS could get me to my destination safely it would be something I could be grateful for. With their voucher in hand I went to the specified cafes. It was so late, some were closed. Some cafes rudely refused me because the voucher could not cover the cost of a hot meal even though I offered to pay the difference. It was too late for most of them to cook something because by 1am the kitchen’s were closed and only a light meal or snacks and coffee were available. Other nominated cafes had nothing within that price range either. Finally I went to one that was manned by one staff member who was cheerful and polite which made me feel better about my situation. So the two vouchers paid for one of cappuccino, one hot chocolate and one 600ml bottle of water but I had to contribute little extra to make up the difference. But after I finished I felt a little low because the tiredness was catching up with me, my adrenalin was running low. Most people wouldn’t have known about the mammoth journey that lay ahead of me. Surely MAS should have ensured that the amount of their meal voucher would actually be enough to cover the cost of a meal. I had previously in Adelaide kept track of MAS via their Facebook interaction and often I had seen someone writing that they were upgraded to business class just because they had asked…….. I’m not sure how legitimate these claims are but I wondered why I couldn’t be that someone? Considering that senior ground staff had my letter requesting for any sponsorship and I was already there with their plane delay I figured I had a chance of an upgrade. I thought that MAS might see the logic in helping me, considering that I was going to be filming planes that take students overseas. Surely my journey to 6 countries, interviewing students who need to use airlines, meeting education departments who need to send their teachers overseas, meeting family members who catch the travel-bug and fly to visit their children overseas, plus us filming food and culture and tourism would have made sense to MAS’ publicity department. Surely our documentary would help MAS. Qantas was also on our list of airlines for 6 North. Anyway, I tried to keep myself upbeat without any proper rest or sleep and managed to find enough strength to board my destination flight to Kansai/Japan. Frankly, I was so tired and keen to get on that plane that I didn’t think about the mechanical problem it had had before. I arrived in Kansai some 4 hours later than scheduled. I was on my way to see Hiroka. She had been one of my students over 10 years ago. There was also one of my earlier students Ai Otsuki, who lives in Osaka who was expecting a baby. She was hoping to meet with me too after travelling from her city but the morning before leaving Adelaide I had a message from Ai on FB that although Ai was planning to come to see me half way between Kansai and Kyoto (which would have been Osaka) she had been taken ill suddenly and needed hospitalisation and her condition prevented her from traveling. I knew that I would not be able to change my plans and stop in her city so I booked my coach ticket directly from Kansai to Kyoto on arrival. It was sad to not meet Ai again after so many years. She felt the same too. So near and yet so far. Since I returned to Adelaide I have not heard from her or her family what was the outcome of her illness. I have yet to hear from her even after several attempted contacts via FB message, so I am hoping and praying for the best outcome and that she will contact me when she is feeling better. After a very courteous processing at the Kansai airport immigration, baggage claim, customs and money exchange areas I went to the information desk to book a direct coach ticket to Kyoto city. I must say their information desk at Kansai airport was simply exemplary in every way. Everyone was so courteous and willing to help, they even came outside to help me buy the right bus ticket! Armed with information I chose to take the airport coach to Kyoto City. Here the driver and ground staff were so courteous that they helped me with many smiles. Everything was no trouble at all to them and they loaded my bags onto the bus for me. I relaxed in the luxurious seat (better than MAS’) and began to nod off now and then. The coach trip is cheap for the length of the journey and the polite service. It can be even cheaper if you book a return ticket which must be used within 14 days which I did. It was good value for the clean comfort and polite service. (In my blog 3/6 I will describe the contrast of Shanghai’s bus service). I would recommend the Kansai coach service to anybody. It is much cheaper than the fast train which is only 15 minutes or so faster then the coach trip. If you’re not in that much of a hurry you might as well take the coach and enjoy the same scenery for less money. On the way we went past Osaka city and we thought of Ai and prayed for her speedy recovery. We finally arrived in Kyoto city, hooray! This airport coach stops you directly outside a famous hotel across the road from the JR railway station where you have access to the trains to many destinations as well as subway line and buses. In this station is a department store call Suvaco. We were meant to stand outside the Suvaco entrance to wait for Hiroka. I had emailed her the night before about my delay and also of Ai’s condition and my rough time of arrival at Suvaco. After not seeing her for ten years my excitement was growing as I waited outside Suvaco. It was approaching peak hour and pedestrian traffic at the station was growing. You will see from the footage how many people were walking past me, any one of them could have been Hiroka but I didn’t see her anywhere. I had no phone. Was she waiting somewhere else? I waited a long time but still no sign of her. Stephen was wired up to film the moment of our meeting but Hiroka was nowhere to be seen. I began to panic. Stephen didn’t. We parked our luggage at the side of the mall outside the Suvaco entrance as agreed then I decided it was time to test my ‘phone theory. I needed to borrow somebody’s mobile to call Hiroka. Stephen approached a young man in the mall and asked if he wouldn’t mind using his phone to call Hiroka’s number. He said sure and dialed. Hiroka answered moshi moshi! Stephen said “Hello Hiroka, it’s Stephen, how are you, where are you? ” So first contact has been made. She told us to stay where we were and she would find us. After hanging up we offered to pay the kind young man but he wouldn’t take it and said he also is new in Kyoto as he is from China! He was leaving soon to the same airport we had just come from. He said to ‘pay it forward’ for his deed instead. We were so pleased that our interaction with people seemed like it was going to work. I waited and waited for Hiroka and an hour went past! I knew she had a baby boy of 10 months and maybe she was having trouble getting there. I opted not to call her again, knowing that she knew we were waiting for her. If I had chosen to make another call it would have meant asking another person to make the call. I started worrying when another hour passed by. I had been traveling for some 36 hours and was getting anxious. I started to walk up and down the mall through hundreds of Japanese commuters. If I saw Hiroka I would not recognise her easily! I thought I saw her with a baby and cried out HIROKA, but a second later I realised it wasn’t her and had to apologise and walked on. Another hour had passed and I was really worried. Stephen yelled out that he had spotted her amidst all those people in the crowded mall….”Hiroka’s there… ‘Where?” I asked, “There” he points” and started filming us. Then I saw a tall slender figure with a baby and a bag coming towards me. She had spotted us too. She had a worried but happy look on her face. It really was Hiroka and she looked the same. She had her youngest son Eito. We couldn’t believe that it had been so many years since we last saw her as a teenager and here we are now together again adult mums, hugging. She’s also a mother of two sons, like me. Now she is going to be hosting us. What a relief! It turns out that we were waiting at a store which is so big that it has another entrance out of our sight in a distant part of the mall and that was where Hiroka had been looking for us for hours too, I felt so bad to keep them waiting! After a train ride together, with Hiroka and Eito who was adjusting to us ‘the foreigners’…… (he became very familiar with us eventually) we then had a 5 minute walk from the station that took us to Hiroka’s suburb, we were introduced to Hiroka’s mother, a softly spoken and a kind-natured lady who introduced herself as ‘Noriko’, ‘I am Hiroka’s mother’. She had her car waiting for us. Hiroka had her car to carry all the luggage. Stephen always complains that I pack more than I ever actually use and that he must endure carrying too many bags on each trip. In hindsight he is right, I do, so I apologise to Stephen for all that lugging! He says the camera shakiness is my fault and apologises to viewers, blaming me for the strain to his shoulders and I indeed accept the blame. We soon arrived by car at Hiroka’s home. She and her husband Yuuki had just built their new house, nestled among others on the hillside of their suburb of Otsu in Shiga. Yuuki was at work. The rain clouds were low and stretched over the tops of the hills around, and in the valleys the fine mist obscured most of cherry blossoms in the distance. Hiroka had written on a white-board displayed in the entrance hall. It had a touching welcome sign that spelt the names of all of the family members we were about to meet soon. We realised how much Hiroka’s experience with us had left a lasting impression on her heart. We were still important to her. After a while a friend’s car arrived to drop off Hiroka’s oldest son Yuuto with his friend from school! What a delightful family, both boys are polite and no trouble at all. 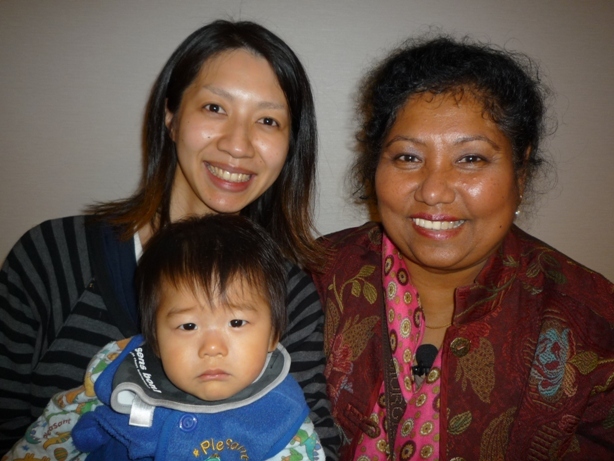 I recall in a letter that Hiroka had written for me once during her Homestay time with me here in Adelaide: “I want to be a mother just like you”. I remembered those words like it was yesterday and felt blessed that indeed she has a beautiful home and a lovely family of her own, just like she had imagined. We are ever so grateful for Hiroka and Yuuki for welcoming us to stay with them to film their family, home, culture, food and environment. We truly appreciate it and in return we ask them to please visit us someday to Adelaide, hopefully soon. It was already 5pm and we had some snacks and green tea and saw that the weather was dull and getting darker outside. Hiroka said perhaps we should have a rest because Yuuki was going to return from work by 7pm and he was going to cook the evening meal because he is a Chef. We agreed that we needed the rest after nearly 40 hours on the go, so we rested. Upstairs we had a room to ourselves with thin cotton mattresses on the floor. This was actually a much needed comfort for our sore backs and in no time at all we were asleep under warm quilts. The boys and the household were so quiet that we didn’t realise we had slept for four hours and woke at 9pm. We came downstairs and were greeted with happy smiles from everyone including grandma Noriko. We finally got to meet Yuuki and were shown by Hiroka that Yuuki had made a wide variety of sushi, sashimi, miso soup, savoury steamed egg custard and tempura vegetables ready for us to enjoy as a home-cooked dinner. Yuuki was the Chef in his previous work and today he has his own business. I felt so privileged to be in the company of a Chef and his artwork in presenting the dishes were second to none. We could see that he had taken much care in preparing all of these dishes. They could have lasted us for few days but because they were so delicious I ate all that was on my plate. They were so dainty and delicious, even if not cooked e.g. sashimi was simply fresh and delicious! At around 1am after a much catch up chat, and with full stomachs, we bid our hosts goodnight and went to have a hot shower and go to sleep again. We knew the next day would be another hectic one to visit as many places as we should to film. First on the list would have to be cherry blossoms of course, then later on go and visit another of our students named Raito and meet his grandmother who had promised to cook us another traditional dish of Okonomiyaki. But our exhaustion meant that we rose late the next morning. We had had an excellent rest. Yuuki had already left home for work. Soon after our brunch of toast and coffee Hiroka’s best friend Hiromi arrived so the interview of their homestay in Adelaide began and then later Hiromi also accompanied us to film the cherry blossom. When Hiromi was studying in Australia she would accompany Hiroka to our home and we would all go out together to sight see in Adelaide. Now we were going to do the same but in Japan! The weather was dismal, grey and wet, not the best to film blossoms in. We decided to stay home and have an indoor picnic of sushi which was meant for our picnic under the cherry blossoms and Yuuki had kindly prepared the picnic for us before going to his work. 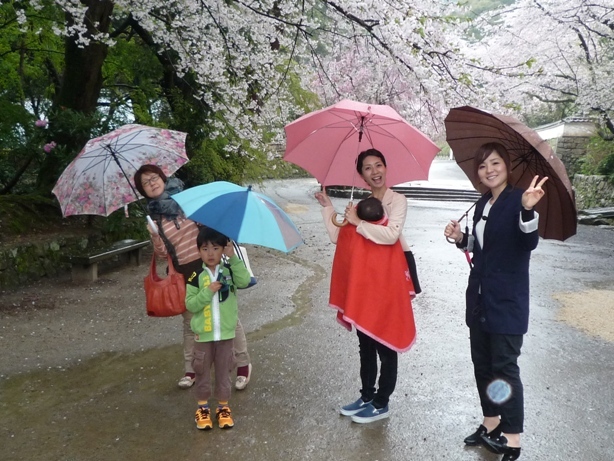 The weather didn’t clear but we knew we had to take our chance sometime or we would soon be leaving Japan for Korea the following morning, so we decided to make our way into the hills to capture the blossoms at the beautiful Shiga Shrine, in the rain. It was wonderful, but we each of us needed umbrellas. The rain knocked the blossoms to the ground like pink snow flakes. After filming in the grounds of the shrine we made our way to the train station to go and see Raito. He had stayed with us just a couple of years ago and he is from Ristumeikan school. 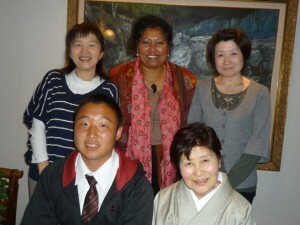 He came here on a two-week study tour arranged by our local school Charles Campbell College. We only just made the train in the nick of time. The next train would have been an hour later and we could not be that late. Punctuality is crucial in Japanese culture. Raito’s Grandmother was waiting to cook for us and we had to make every effort to get there on time. Hiroka and Hiromi sorted out our train tickets for us which was wonderful. In all that rush I nearly forgot to remember their instructions about where to get off and then board our next train for another hour’s ride to Raito’s nearest station at Sett Tonda. Raito’s mother Chiyo would be waiting for us at that station to drive us to ‘Grandma’s home’. As usual I started talking with strangers (ladies in their 70’s) who weren’t from Kyoto but were on a hiking journey in Kyoto. After our chat we had forgotten that we were to stop at the 4th stop to get on to the next train. The ladies stopped at the 3rd stop and when they left, we saw many people gathering on the train to get off on the next stop. We asked those waiting to get off if this was the fourth stop and they immediately said that it was the stop for the next train! !In the nick of time again! We waited on the platform described by Hiroka and Hiromi and before long we were on the train traveling to meet Raito and his family. I recall being told that it would be something like 16 stops till we were supposed to get off. I asked a couple of ladies sitting opposite us and without English they nodded when I pointed to the destination. The train ride was scenic of more cherry blossoms and a smooth ride. The driver’s announcement was very clear so we arrived at our destination without much concern. As we made our way to exit we see a hand waving with 2 more umbrellas in her hand and we guessed it was Raito’s mother Chiyo because she was focusing on us and beckoning us to go to her. Lucky it was her! She recognised us no doubt from photos Raito had shown her but she couldn’t speak English and neither could we speak Japanese! She drove us back to her mum’s with fewer words spoken due to the language barrier. It was a little bit like when meeting our students from the airport and driving them for the first time to our home in Adelaide. Everything made sense regarding this journey, only this time in reverse. We were welcomed to Raito’s Grandma’s house wholeheartedly by Grandma, Grandpa and Raito’s aunt but Raito was still at his Rugby practice! When Raito was in Adelaide, rugby was what he wanted to play and I am afraid that rugby is just not a big sport in Adelaide. I remember taking him shopping for rugby gear and the small range of rugby gear that they had in our sports stores was all too expensive for Raito’s liking. I am told that this year Raito and his team will take part in New Zealand for their training and competition. International schooling is a competitive market between Australia and New Zealand. Grandma was elegant and cheerful in her traditional Kimono which she put on for us especially. Her home was grand and immaculate, double story detached, like an Australian home in a nice suburb. Sometimes Homestay students don’t show what their homes are like. 90% of the time we are told if a student is coming from Japan their home would be a high rise apartment/unit/flat etc. but I saw plenty of houses in Japan. The two houses that we visited were very pleasant double storey homes with all the mod cons like toilets that flush by itself with heated seats and even the cover of the toilet comes down automatically when you leave the room, my home certainly can’t compete with these. These homes have well- kept gardens too, not like mine, Bonsai grace these gardens well! Some students may adapt better to their Homestay home if it is similar to their own home. We certainly felt comfortable in the homes that we visited. Raito had always said that his Grandma’s Okonomiaki is the best in his city. “The best Okunomiyaki is at my grandma’s house” he would say. Well before I knew it, Grandma with her two daughters was ready to give me the tour of her house. Immediately we got seated on the floor but at a table with our feet dangling in a heated recessed below the floor level. We could feel hot air warming our feet, a great idea for their cold winters and generally speaking their favourite spot for anytime of the day, especially during mealtimes. Grandma says that she usually does her knitting there and the warmth sometimes makes her drowsy so she falls a sleep there! When I asked if Grandpa enjoys the warmth too she says no, Grandpa usually goes out so this is more of women’s thing! Anyway she must be right because after meeting Grandpa on our arrival we did not see him again all evening. We got ushered to their prayer alter next which was in the same room. The sisters and Grandma showed us how to light the incense stick and pray for what the heart desired…. so I prayed for love and happiness! 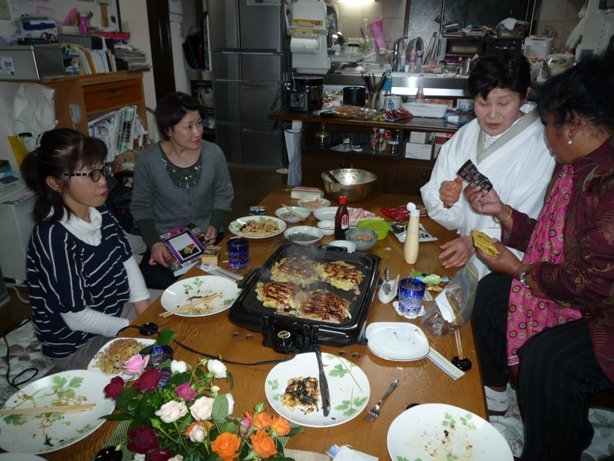 Next we sat at a low table on the floor in their dining room next to their kitchen where Grandma was going to prepare her famous Okonomiyaki for us to film. A square electric hot plate had been set in the centre of the table and coated with a drizzle of oil then that had been wiped over the non-stick surface. Thin pieces of meat were positioned in the four corners then octopus pieces and prawns were placed with the meat. 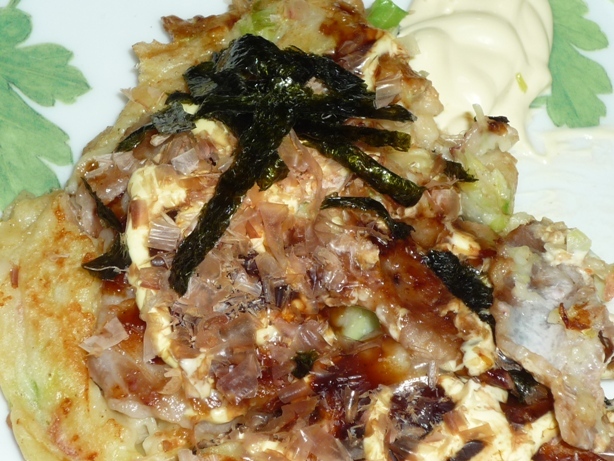 A seasoned pancake batter with shredded cabbage stirred through it was poured over the surf and turf mixture. A few minutes later each batch was turned over to reveal the golden colour underneath. Another few minutes of cooking then Okonomiyaki sauces similar to BBQ and Mayonnaise were drizzled over the four pieces in lattice pattern. Bonito flakes and shards of seaweed were placed on top for extra flavour. The dish was delicious but the quantity was so generous that it was too much for us all to consume until Raito arrived and he left nothing behind. Grandma’s cooking is his favourite. Grandma says that she always cooks extra for Raito because that’s where he gets his strength for rugby, by consuming large quantity of nutritious food. Chiyo shares with us that Raito loves staying over at Grandma’s because of her best cooking and Raito agreed! I was glad to have Raito stay with us because not much food went to waste during his stay in our home. He was always cheerful and happy during meal times and I remember him helping me at meal times too. You see I didn’t have a problem making double sandwiches for Raito’s lunch either because I knew he would eat it all. On the other hand a different student who is a small eater would return with sandwiches intact after school. When international students are staying with you it is better to give a generous packed lunch during their first day at school so that you are not seen as uncaring. Then after a few days you can gauge what will be eaten. If not they would ask you for more but most Japanese students would be shy to ask so it would be best if we asked them instead. Grandma also made dessert for us but we were so full that we struggled to find space for it. After a good night of sharing notes about the weather, people, food, schools, rugby and all sorts of topics it was time for us to return to Kyoto which would be quicker by car, about one hour. The train service had stopped so Chiyo had already offered to Hiroka that she would return us home by car. We said goodbye with many generous gifts from each of them and an offer of a Kimono from Grandma which I declined. Nice as it was, I had to consider how I was going to transport all of them from country to country, this being our first country out of 6. The last farewell picture will remain etched with memories of a really good time with grandma and her family, so ‘Thank you’ to Raito and Chiyo for the invitation to enjoy Grandma’s cooking and everyone’s hospitality! We arrived very late at Hiroka’s in drizzle. Little Yuuto had not gone to sleep because that it was our last night there. He knew that we would be taking the coach in the morning back to Kansai to fly to Busan in Korea, so we all stayed up late that night and had family time together. Stephen taught Yuuto how to play ‘Shove-ha’penny’ and Yuuki watched on and then joined in the game too, so that father and son can play in Stephen’s absence. We had told Hiroka that it was OK for the boys to call us ‘Nani’ Sarj and ‘Nana’ Stephen, which in my mother tongue means maternal Grandma and Grandpa and it was so cute to hear Yuuto say it! We both were touched by his interaction with us at such a young age. He learned a few English words too from Hiroka like ‘I love you’, and ‘Good night’ and so on…… I can really see Yuuto as a future international student in my home. Just like his mother, perhaps in 9 or 10 years time. We have no doubt that our doors will be open for him and his brother to come live with us when studying in Adelaide. Thank you Hiroka, Yuuki, Yuuto, Eito and Grandma Noriko ….. for your hospitality, for your kind gifts and especially for loving us. Thank you Hiromi for taking time off work to tell us your story as a Homestay student on film, and thank you also for your thoughtful gifts even though you have lost contact with your Homestay Tony we will see if we can make contact with him on your behalf. 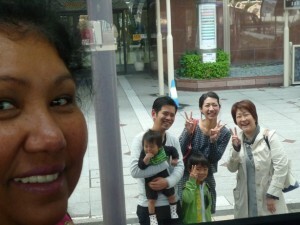 After only a couple of nights stay in Kyoto the next morning was an emotional one and soon we were saying goodbye! 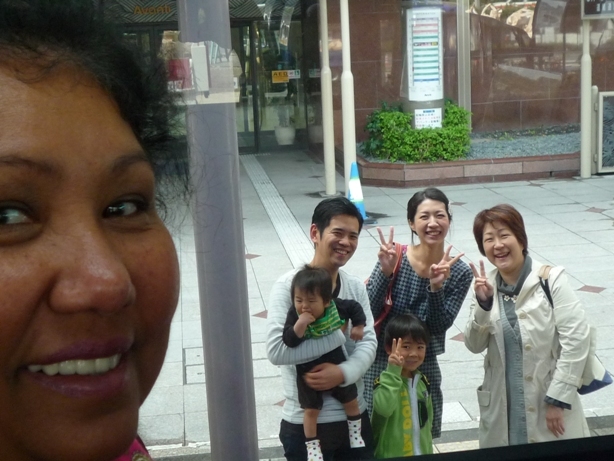 The whole family came to the bus stop to see us off by coach to Kansai airport again. This blog is my way of saying thank you to each who participated in my documentary journey in Japan. Look out for my next blog post in Part 2/6 of this journey which will be based in Busan, South Korea. You are welcome to comment here or simply go to my Facebook documentary page ‘My Recipe for Cultural Interchange’ or ‘Simply Sarj Kitchen/Cooking’ page for daily information relating to this documentary project. I shed a few tears along the way with some touching stories. These will be told in the edited film. Cheers and keep sharing my journey post and recipes till then!